Multiple word, highly-targeted search terms. Long Tail search terms produce more targeted traffic and less competition when compared to more generic one or two word terms. For instance let’s assume you sell model kits of World War II era airplanes. It’s likely that most of the people (say 99%) who search for “airplanes” or “models” won’t be interested in your more specialized product. However, everyone who searches for “World War II model airplane kits” is likely to be a potential customer. Therefore the traffic (organic or paid) from one search for “World War II model airplanes kits” is more valuable to you (and easier and cheaper to obtain) than the traffic from 100 searches for “airplanes” or “models”. 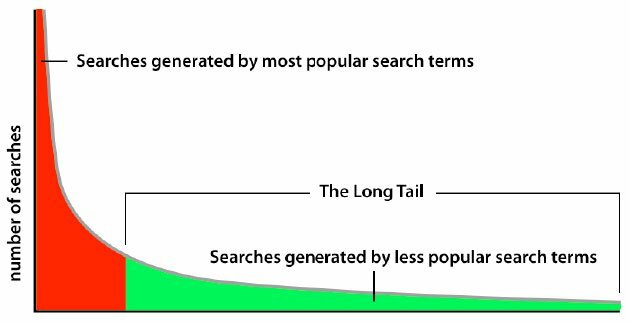 The term long tail search refers to the curve of a graph of search volume generated by related search terms (not to the length of the search phrase). A few, popular search terms generate a large proportion of searches while the rest of the searches will be spread out among less popular but more focused terms in the “long tail.” It is often more productive to spread your SEO efforts among several less competitive but highly focused terms in the long tail than to focus all your efforts on one or two popular, highly competitive terms.